★★★★★ Easily the best camera I have ever used. Still have my D810 and D7000 but neither of those get used anymore unless I have need of second camera. The combination of nearly 46 megapixels, excellent low light performance, topped off with up to 9fps (with the optional MB-D18 battery grip and EN-EL18a batteries) are a killer combination. It meets all my needs and then some. Super versatile, high quality camera that provides killer images in almost every situation. 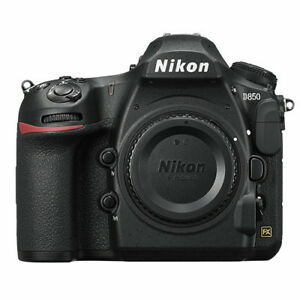 ★★★★★ This is the 5th digital camera I have owned and the 4th Nikon DSLR. The D850 has already proven to me how awesome the camera is in the durability and photo quality it produces. This is more like a high end computer in terms of what it does in camera. The focus shift (stacking) feature is amazing. The color rendering in camera (jpg) is amazing. The raw photos (NEF) are large and allow excellent cropping opportunities without pixilation. You will need good Nikon lenses to see the best this camera has to offer. 2 thumbs up for the D850. ★★★★★ Lots to learn but the d850 is a great camera for video and photo. This is a professional camera with many great features. Too many to cover in this review. As a professional photographer I could not be happier with this camera. ★★★★★ Pros: 45 megapixels is awesome coming from 24 haha. Not only does it shoot raw images, it can shoot raw video as well. LCD illumination on the top analog screen is a nice touch (optional) Heavy and fits big hands well Customization out the wazoo! ★★★★★ Upgraded from a Nikon D5500 to the D850. Many features that simplify shooting. 45 mega pixels aren’t so bad either. I shoot Nature and landscapes. Still to soon to give my thorough opinion, but I’m impressed so far.